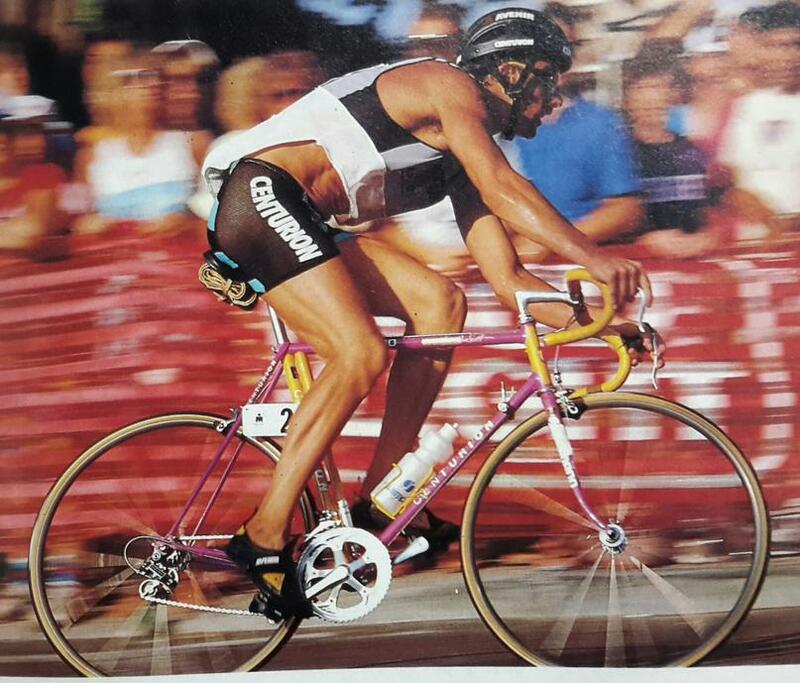 In 1986 The Ironman continued with Shimano 600, and since SIS had been introduced the Ironman now wore Shimano 600 SIS grouppo, or N600 as it was marketed. The Frame kept the Tange #1 tubing but wore a new paint scheme. all of the frame graphics got revised. This started the Geometric Shape on the Centurion logos on bike which would reach its pinnacle in 1988. 1987 Saw a major change for the Ironman as it was now split into two different models, the current Ironman with the 600 SIS was now called the Ironman Master, and another model was introduced the Ironman Expert. this model featured the all new redesign of Shimano 105, with technology such as SIS, SLR, BioPace. this model had alot of bang for the buck. It also was the year for even wilder paint, as The memphis Design group style was in full swing with the popularity of Miami Vice. Centurion Offered the Ironman Expert in 2 different colors. the usual red and white (also offered in 1986) and the very bold Magenta and Yellow model (some refer to it as pink, but for 1987 that was way to dark to be pink, think pastels). The Master model had a Aqua and White and Yellow and White paint scheme. 1988 The Expert retained most of all the same componentry that was offered in 1987. Master model was released with the new 7 speed Shimano 600 Ultegra. The paint scheme had changed again along with different colors and more creative paint schemes as the Master featured. the format of the paint was different, the Headtube/Fork was the secondary color and would fade into the primary color on the down tube and top tube. and fading back after the seatpost on the Seat Stay and Chain Stay returning to the secondary color. The Ironman model name was dropped in 1990, and WSI dropped the Centurion name and Introduced the road bikes in the Diamondback brand which was primarily BMX and Mountain Bikes previously. For the first couple years they featured a "Centurion Designed" decal. They continued on with the Master TG and Expert TG. The geometry was more relaxed, but the "Master" and "Expert" names still lived on, as did the marble fade paint jobs. The Master featured 105 instead of 600. Centurion measurement for the Ironman frame sizing, was from the c-bb to the t-top tube. Centurion referred to it as "to the lowest part of the scallop on the side of seat lug." In reality it is the same as the top of the top tube. * Magenta/Yellow Color, Commonly mistaken today as pink in color. but is truly Magenta. in the late 80's pink was alot lighter of a color in popular culture. In many fan groups this color scheme is referred to as a Miami Vice Ironman.